Provide comfort for the family of Luz Badger with a meaningful gesture of sympathy. 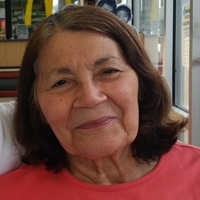 Luz Esther Badger, 81, of Biloxi, died February 18, 2019, at Blueberry Hill in Poplarville, MS. She was born on August 4, 1937, to Jose Cabrera-Berrios and Josefina Colon-De Cabrera in Yabucoa, Puerto Rico. Luz and James Fred Badger, II were married for thirty years. Luz was a devoted mother and grandmother and loved her family very much. Luz is preceded in death by her parents; one brother, Jose Cabrera Jr.; one sister, Virginia Cabrera. She is survived by three sons: Ray Cardenez(Angela), Angel Cardenez(Michele), Juan Jose Cardenez; two brothers, Angel and Benjamin; three sisters: Angelica, Abigail, and Ruth; 10 grandchildren: Joshua, David, Angelina, Daniel, Brianna, Zachary, Felicia-Marie, Dylan, Dominic and Donavan; five great-grandchildren and a host of nieces and nephews. In lieu of flowers, donations can be made Alzheimer’s Association in honor of Luz. A private memorial service for family will be scheduled at a later date. To send flowers in memory of Luz Esther Badger, please visit our Heartfelt Sympathies Store.